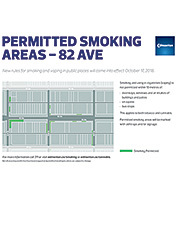 The City of Edmonton's Public Places Bylaw regulates where smoking is permitted in public places: this includes tobacco, vaping and cannabis. Effective October 17, 2018, there are new rules on smoking and vaping. Smoking cannabis and tobacco will be permitted in private residences. However, private property owners may establish their own restrictions for smoking on their property. For more information on particular interpretations of the bylaw, check our Frequently Asked Questions. In addition to the new rules in the City of Edmonton on tobacco smoking, the Province of Alberta also regulates tobacco smoking in public places through the Tobacco and Smoking Reduction Act. Citizens are encouraged to familiarize themselves with the provincial rules. Discarded cigarette butts are one of the most common forms of littering in the city. Business owners and managers are responsible for ensuring the area around their business is free of cigarette litter. The city has several programs to help keep Edmonton free of cigarette litter.